Computer Science I: Fundamentals is an introductory course on computer programming with an emphasis on problem solving techniques. During the semester, students will gain proficiency in skills that are fundamental to solving computational problems, namely: (i) reading and understanding descriptions of computational problems that may sometimes be stated incompletely or imprecisely, (ii) breaking down a computational problem into simpler subproblems, (iii) designing algorithms for computational problems, (iv) translating algorithms into pseudocode and then into programs, (v) testing and debugging prgrams, and (vi) understanding time efficiency and memory usage of programs. Students will learn the importance of iterating through the above sequence of steps to build correct, well-documented, efficient, and reusable programs. The key programming topics include variables, expressions, data types, control flow statements, functions, data structures, objects and classes. The course will use the Python programming language. 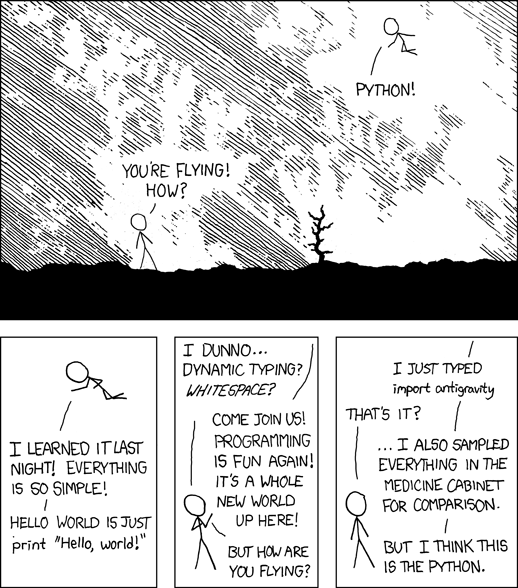 Python can be used interactively and can be accessed on Linux/Unix, Mac, and Windows platforms. The course is the starting point for computer science major and minor curricula, and also useful to other majors as a rigorous introduction to programming and solving computational problems. This semester the course has two sections. The "main section" (CS:1210:0AAA, 22C:016:AAA) consists of three lectures per week, with an additional discussion section that meets once per week. The "evening section" section (CS:1210:0SCA, 22C:016:SCA) meets twice a week, with no separate discussion sections. The course has been assigned 3 TAs, who are graduate students in the Department of Computer Science. Information on their office hours and contact will appear here shortly. Below you can see names of the TAs and the discussion sections they will be leading. Renjitha Nair (renjitha-nair@uiowa.edu) will lead discussion sections A01 (Tuesday, 9:30-10:20, 215 PH) and A03 (Tuesday, 12:30-1:20, 66 SH). Jamie Moore (jamie-e-moore@uiowa.edu) will lead discussion sections A02 (Tuesday, 11:00-11:50, 113 MLH) and A06 (Tuesday, 3:30-4:20, 346 JH). Preethi Ambati (preethi-ambati@uiowa.edu) will lead discussion section A04 (Tuesday, 2:00-2:50, 219 JH). Jamie Moore: 1:30pm-2:30pm W and 11:30am-1:30pm F.
TAs will hold office hours in the Computer Science Lab, 301 MLH. 5/6 The final exam is on Wednesday, May 15th from 10 am to noon in W10 PBAB. Here is more information about the exam. 4/30 Project 2, with Stage 2 specified.. Stage 2 due via ICON dropbox on Friday, May 10th at 4:59 pm. Project 2, Stage 2.